Summary: Legally the president makes the decision and everyone else then scurries around and follows his or her orders; in practice it's not going to be that simple in peace time especially. He or she doesn’t just have a button to press and the weapons fire; it’s a figurative expression. A president who gave that order in peacetime would surely be treated as temporarily deranged and ignored. They would need broad support, from their defense secretary especially. However, in the event of an imminent attack on the US they decided that the president has to be able to launch a response within minutes. This is a result of the cold war and the idea of MAD (Mutually Assured Destruction). For that reason the president has been given authority to launch an attack on his or her own without consultation. That's the origin of their power to launch. But it's only meant for situations where they believe that another country has already launched nuclear weapons towards the US. Although legally the president could invoke this ability in any situation, and just launch nuclear weapons on a whim because they are angry or having a bad day or whatever, they would surely be ignored if they tried to invoke this ability to launch within four minutes in peacetime. Legally that would be mutiny, but those who refused to obey the orders could argue that their president is deranged and unfit to serve, and at any rate in such circumstances nobody would be likely to challenge the refusal to obey his or her commands except the president him or herself. It would probably lead swiftly to impeachment. I wrote this for my new blog "Debunking Doomsday" on Quora. I get so many pm's and comments about doomsday stories and it would overwhelm this blog to post articles debunking all the stories you get every week here. So I've started a new blog, and you can tell how many questions I get in this topic area, as nearly all the posts there so far are for questions I've been asked since yesterday. See Debunking Doomsday. First to be scared of nuclear war certainly is a rational fear. It’s not a hoax or an absurd idea like most of the ones I debunk. I had some fear of nuclear weapons during the cold war. Including nightmares that we’d been hit by nuclear weapons. I’m sure many did back then. Not so much now, because I don’t feel that an all out nuclear war is likely myself. We are much more connected world wide, than before, with internet, and fast communications, satellites etc, and though there are tensions between Russia and the US, also involving China, it’s nothing like what it was during the cold war, seems to me. And everyone has so much to lose in an exchange of nuclear weapons. Anyway many people are worrying about the US president or Putin starting a nuclear war, particularly the US president as a result of the short exchange on nuclear weapons between Hillary Clinton and Donald Trump in the third debate. It says that a president can order a nuclear attack all by himself or herself in theory, as the two person rule only applies to missile silos and submarines. The defense secretary doesn’t have to approve it, as he or she is second in chain of command to the president who makes the order. "The NCA consists only of thePresident and the Secretary of Defense or their duly deputized alternates orsuccessors. The chain of command runs from the President to the Secretary ofDefense and through the Joint Chiefs of Staff to the Commanders of the Unified andSpecified Commands." But in practice a president who ordered a nuclear attack in peacetime might well face some kind of a mutinous action, refusal to follow his orders, moves to be declared unfit to govern etc. This actually happened to president Nixon, not that he ordered an attack, but that towards the end of his presidency they no longer trusted him with the nuclear button, because of drink problems etc. So, though it was not legal for them to do it and probably mutinous considered from a legal point of view, the secretary of defense James R. Schlesinger instructed the military to divert all emergency orders especially any involving nuclear weapons, to him. In the circumstances nobody was likely to challenge this. There’s a difference here between a decision to do a first strike, and a response to an attack. After being told about an attack, the president may have only minutes to decide whether to treat it as a false alarm or to respond, and what response to take. That’s what Hillary Clinton is talking about here in the third debate, six minutes into this extract. It’s confusing because she pivots. She starts by talking about Trump’s idea of a unilateral nuclear attack in peacetime. But the end of her sentence when she talks about the 4 minutes and saying that former presidents say Trump is not a suitable person to respond in a situation like that she is talking about response if you hear that there has been a nuclear attack on the US. Is it a false alarm? Do you get on the phone to Putin or to China or N. Korea or whoever? Or do you just respond right away. She is saying at that point that he is not a fit person to make such a decision. But she isn’t saying that a president in peace time can launch a nuclear attack with only 4 minutes of warning for no reason. If a president did that I’m sure they would be treated as temporarily insane, of diminished responsibility, and ignored. Whether it is Clinton or Trump or whoever it is. But because of the pivot it’s not so clear, she is somewhat giving the impression that Trump would be able to launch a nuclear weapon in peacetime within 4 minutes. If challenged I’m sure she’d deny that is what she meant. It’s the sort of thing politicians often do in debate to score a point, pivoting like that. Incidentally I think it is totally immoral to launch nuclear weapons at all and if someone has dropped a nuclear weapon on your state, heaven forbid as they say, then it does not make it acceptable to use them. Jeremy Corbyn, leader of the opposition in the UK, and long term opponent to nuclear weapons has said that if he is prime minister he will never give the order to launch nuclear weapons. Theresa May has said unequivocally that she would, if it came to it, the first prime minister to answer this question in the affirmative (previous ones have refused to answer). So we have quite a polarity in politics on this matter here in the UK. Also - longer term, I believe that it is definitely possible that we could end up with worldwide nuclear disarmament. Personally, I’ve been against nuclear weapons all my life, you may know that Scotland wants to disarm, and it’s a policy of the SNP. and if it became an independent country it would give up its nuclear weapons. Also the leader of the opposition Jeremy Corbyn wants to disarm. Very few nations actually do have nuclear weapons. Africa, Australia, New Zealand, South America - they all have formed nuclear weapon free zones. The entire Southern Hemisphere is a nuclear free zone. All the blue areas on this map are nuclear free. And most nations of course don’t have nuclear weapons of their own. Only the red zones here actually have their own nuclear weapons. The orange ones are nuclear weapons sharing. It’s about time we had a few more nuclear weapon free zones in the northern hemisphere. So also some people worry we would all go extinct as a result of a nuclear war. But if you think about it only the people in the red or orange zones are likely to be hit by nuclear weapons - as nuclear weapon states mainly target each other. The chances are that the entire southern hemisphere would have no nuclear weapon hits at all. And anyway humans are much harder to make extinct than you might think. We are amongst the most resilient of all animals. As mammals able to survive almost anywhere, cold or hot, travel easily, eat almost anything because we are omnivores, able to farm, cultivate anything edible. And for sure could take precautions against radioactivity. This also is one reason why it actually makes more sense from a safety point of view to give up nuclear weapons. As someone who has been a long standing opponent of nuclear weapons for the UK, I don’t see how it gives us any security at all. It’s not as if the only thing stopping Russia from taking over Europe is our nuclear weapons. And anyway when they want to invade somewhere like the Ukraine or whatever, nuclear weapons don’t stop them. It just makes no sense to me it just makes us a target. The SNP is against nuclear weapons, the majority of the residents of Scotland. In the debate in the UK parliament one of the main reasons they gave for retaining nuclear weapons was because we would then keep our seat in the security council. They thought if we gave up our nuclear weapons we might no longer be a permanent member of the world security council. That’s really backward thinking, seems to me. If nuclear weapons are seen as a prestige symbol, how can we ever get rid of them? They also said we need nuclear weapons for multilateral disarmament. But you don’t need multilateral disarmament to create a nuclear free zone. The African nuclear free zone resulted from unilateral disarmament by South Africa. If we are ever to have a European nuclear free zone, then unilateral disarmament by the UK seems a good way to start. And as for the idea that would make us dependent on the US -that’s only if you think nuclear weapons give us security. If you don’t think that ,then it doesn’t make us dependent on them at all. Rather it makes us more independent as we don’t spend more than 200 billion dollars on nuclear weapons which takes away from the budget we could use for other things. Military generals in the UK say that nuclear weapons are an outdated and useless defense system, they don’t see any need for it in their campaigns it just does nothing for them. As a pacifist myself I am uncomfortable arguing for increased military expense on conventional weapons. But that is what would happen if we reduced nuclear weapons that they would be more capable in conventional arms. Perhaps also we’d have some extra budget for non military things, let’s hope. The US of course would find it much harder to go nuclear free and not suggesting they do so unilaterally, better to do it in collaboration with Russia, China and everyone else. But in the UK we can go nuclear free and start to turn thinking around so that instead of thinking of nuclear weapons as prestigious and making you strong, more people start to see them as outmoded, expensive, useless. And hopefully start to get the idea that it is actually prestigious to give up nuclear weapons. That may then eventually lead to a nuclear free world. DO NUCLEAR WEAPONS “PRESERVE PEACE”? On whether it saved lives in Japan - well it’s mainly a US rather than a Japanese perspective I think, that it might have saved lives eventually. Not the sort of thing that you’d use to justify a foreign country dropping nuclear weapons on your own cities. Then, whatever you think about whether they should have used it at all, I think it was unacceptable to drop it on a city. Why didn't they drop it on an uninhabited island off Japan if they had to do it? That would show its awesome power. I don't find the argument valid at all that they had to kill large numbers of people to show how powerful it was. And had to do that twice what's more. Albert Einstein who was one of the people who advocated developing the bomb was horrified that they actually used it and many others at the time in the US said it was the wrong decision to make. 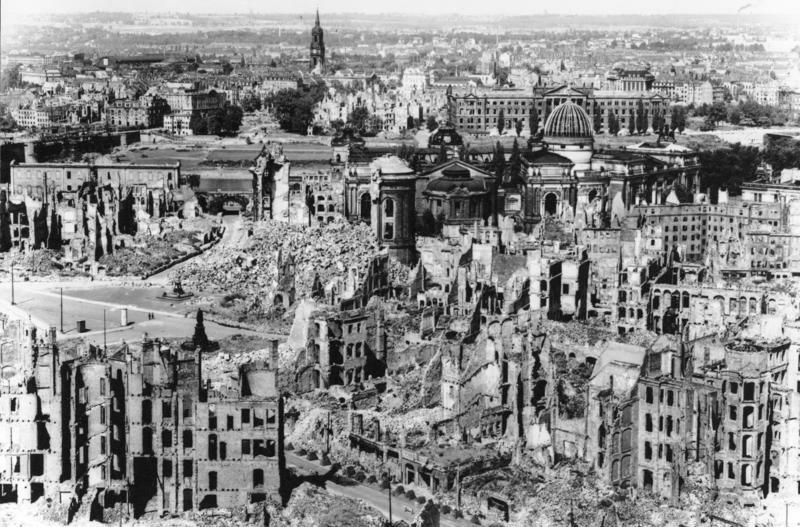 A friend has made an interesting point, that for the generals it seemed like a fire bombing of cities, for instance the fire bombing of Dresden, which had already happened before. Center of Dresden after fire bombing by the UK in WWII, image from the German Federal Archive. Firebombing of cities in WWII is a highly controversial action taken by the Allied forces with much debate since then. Which actually I think is morally beyond the pale too, and it surely would not be considered acceptable as a policy by generals in a modern conflict, but they had gradually through more and more of that sort of thing got used to that as something they did in war time. Only the scientists like Albert Einstein really understood the horror of a nuclear bomb at the time. As for whether (if it is true that it reduced the number of deaths) that it justifies it in hindsight well the thing is it is easier to use such arguments to justify it on another country. Try turning that around and suppose the nuclear weapons were dropped on the US (or whatever country you are citizen of) which for some reason had a fanatical government at that time. It doesn't work so well that way around. And at any rate that’s past history. We now all know how horrific nuclear bombs are. And nowadays hardly anyone, military generals or anyone, would say that it is morally acceptable to fire bomb a city to oblivion as for Dresden in a modern conflict. As for modern conflicts, then if, say, North Korea was to drop a bomb on Japan, or South Korea or even, somehow, the US, well they would get immediate condemnation of the entire world. China would no longer be able to support them in any way, and that would surely be the end of their regime, seems to me. We are in a world so interconnected that it is not possible for a small industrial nation to stand against the entire world like that. While if the US then responded by dropping a nuclear weapon on N. Korea, that would then turn condemnation against the US and China would then feel justified to continue to support N. Korea. It makes no sense politically for the US to respond by retaliating in that situation. And in a nuclear free world, if N. Korea was the only remaining country with nuclear weapons, it would be even more stark, if they dropped nuclear weapons against another country with them the only country in the entire world to retain the nuclear weapon. I think what we need is a change of attitudes according to which nuclear weapons are seen as useless, expensive, immoral, and instead of being a matter of prestige are a matter of denigration and ridicule by all the other countries. DOES THIS MAKE THE WORLD LESS SAFE TO GIVE UP NUCLEAR WEAPONS? No, not at all! Those of us who say we should work towards nuclear disarmament, establishing more nuclear free zones, encourage unilateral disarmament of the smaller countries like the UK etc, aren't saying that US or anyone else should give up their conventional military. But I don't think there is any evidence that nuclear weapons stop countries from invading. It did nothing to stop Russia invading Ukraine or to stop them from what they are doing in Syria which many object to. It did nothing to stop Saddam Hussein. It is doing nothing to stop North Korea. It surely does nothing either to stop superpowers or small nations. It just puts everyone on edge and makes it possible that there could be a horrible disaster / mistake. That's how I see it. IS THIS NOT AN UNREALISTIC HOPE - THAT EVERYONE WILL BECOME SAINTS? I don't think it is unrealistic at all. It doesn't need people to be especially evolved or to have a higher consciousness or anything like that. After all nearly all countries don't have nuclear weapons. And all of the southern hemisphere is nuclear free already. The people there aren't saints or special in any way, they just see it as sensible. Australians for instance aren't champing at the bit to have nuclear weapons. Rather the opposite, the very idea is unthinkable to them, that they would adopt nuclear weapons, for most australians and new zealanders etc. The won't even permit the presence of ships carrying nuclear weapons from other nations. I think it just needs a change of attitude like that in the rest of the world. Sort of like apartheid in S. Africa. For many decades it was just the norm. But then there was a change until it became unthinkable. Not because people became perfect, just because of a change in ideas. On a simpler level, when I was young then it was thought to be extremely eccentric and dotty to try to recycle. Now everyone does it, in the UK anyway. Even in the remotest areas - I live half a mile from a tiny village of 200 people on an island, by a single track road with passing places, and we have separate bins for every household for paper and glass and a recycling truck come round once a fortnight. If you drive you can go to the nearest recycling center which typically will have several dozen different bins for computers, bicycles, washing machines, carpets, clothes, shoes, garden waste - you name it, if it can be recycled, there's a bin for it. I understand from friends that though it is common in the big cities in the States, in some rural areas it is still not done, and recycling is still ridiculed as it was here when I was a child. If so, I expect it is only a matter of time before it becomes normal there as well. Recycling in some form is now supported pretty much world wide. Recycling bins in Japan,image by Jorge. In the 1960s and 1970s recycling was something that a few eccentrics would try to do, with no recycling centers, and no support for it at all. Now you get recycling collection services going around to every house, collecting the recycled card paper and glass along with the domestic waste in separate bins, here in the UK at least. And there's recycling pretty much world wide now, surely most countries have it though some may embrace it more than others..
That's not because we are much better people than we were in the 1960s and early 1970s. It is just because of a change of society and ideas. So, I think we need a similar change according to which nuclear weapons are thought of as unsafe, expensive and useless and most important, just silly. Rather than making you powerful, they make you vulnerable and other countries would ridicule you for being so backward as to think that nuclear weapons help you in any way. If they can come to be seen like that, as a matter of ridicule, and the sort of thing that leads other countries to treat you with very low esteem, if you still have them, then the change will happen perhaps almost by itself like the end of apartheid once the ball got rolling. And we do have the example at least of the nuclear free zones in the southern hemisphere to show that it is possible.